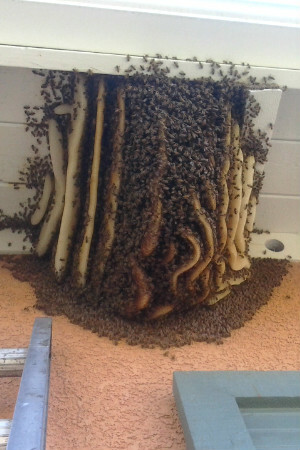 Beehive removal becomes important to prevent property damage. A bee colony’s favorite place to hive is in the framing between walls of structures. Similarly, beehive removal locations include: under eaves of enclosed fascia and Spanish roof tiles. Also, water control boxes and any type of enclosed utility box is also very common. Lastly, any equipment or vehicles left stationary and unused for long periods of time, underneath standing construction trailers, in light posts, in the trunks of trees, are also common places for beehive removal. Click here for a graphic on favorite beehive locations. Once the colony builds a hive and establishes its territory it will become very defensive. Being near the hive area becomes dangerous. At that point, the colony does NOT leave on its own and generally will not abandon that hive. Even if bees are treated, honeycomb left in the wall will continue to attract bees into the area. Because beeswax remains inside an enclosed structure, it will emit a honey odor. As a result, any hive left in a wall may attract ants, rats, and other critters. An unattended hive may leak honey and emit a sweet, pungent odor causing mold. All hives and honeycomb should be removed from structures by a professional beehive removal expert. Note, feral bee honeycomb is not safe for human consumption. Do not eat any honeycomb made by feral bees. If the bees have accessed a structure and been in the area for more than 48 to 72 hours, there is honeycomb in the structure. Bees become territorial when honeycomb is present. Being around the hive area is dangerous to residents and pets. Bees will NOT leave on their own once the honeycomb is built. Honeycomb can attract rats, mice, roaches, ants, etc. It will also act as a lure for new bee colonies, which can include the Africanized bee. Honeycomb inside structures must be removed by a professional to prevent further damage. The Bee Man specializes in beehive removal and takes pride in removing all honeycomb completely and efficiently.